BC AT WAKE FOREST | SATURDAY, 3 P.M.
Harold Landry has 12 sacks this season, tied for third in the country. 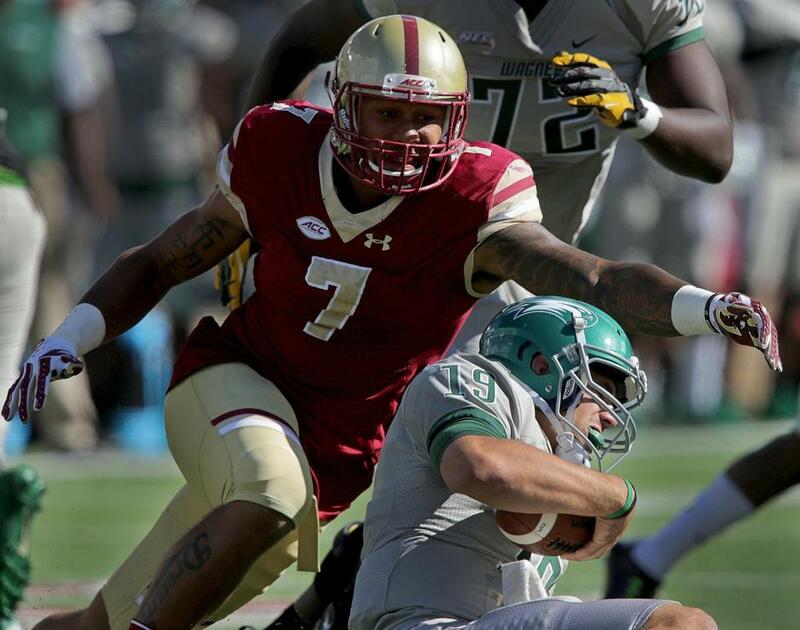 The seed was planted in Harold Landry’s mind last season whenever he watched the way Mehdi Abdesmad went about his business on the Boston College defensive line. Landry, a fellow defensive lineman, was just a sophomore. Abdesmad was a battle-tested senior. Landry looked at Abdesmad like a big brother. “I really learned everything from him,” Landry said. He watched the painstaking steps Abdesmad took to work his way back from a left knee injury that cost him essentially two seasons. He paid close attention to how meticulously Abdesmad handled his rehab. He saw how Abdesmad’s attitude and work ethic turned him into a force on the Eagles’ top-ranked defense and ultimately put him on a path to be signed by the Tennessee Titans. From all the observation, Landry had a template for himself. Landry came into his junior season believing he had to set an example for a defense out to maintain its status as one of the best in the country. After he had his knee scoped just before preseason camp, he was diligent about rehabbing, knowing that younger players such as sophomore defensive ends Zach Allen and Wyatt Ray were watching. Being on the field for the opener against Georgia Tech, even if he was limited to four snaps, was a statement. “He just leads by example,” Allen said. “He’s always doing great things on and off the field, and we all — us younger guys, and even the older guys — try to emulate that. When the Eagles faced powerhouses Clemson, Louisville, and Florida State, many players were going into high-pressure environments for the first time, but Landry set the tone: the defense would refuse to be intimidated. “The first one we played was Clemson,” said Allen. “It was a different atmosphere, and just the way he came off — the first series he made a play — you just feed off of that. We got that he could play with anybody and he was telling us that we can play with them. “I think the young guys — Zach and Wyatt and the rest of the people on the D-line — they see how hard I work,” said Landry, a 6-foot-3-inch, 250-pounder from Spring Lake, N.C. “And I think that puts in their mind, they want to be potentially where I’m at, in my situation. Even though a defense that gave up the fewest total yards in the country and the fourth-fewest points per game a year ago is now giving up 313 yards (12th overall) and 25.5 points (50th) per game, the BC run defense is still one of the best in the nation (103.0 yards per game, eighth). BC has held six of its 11 opponents to less than 100 rushing yards and two of them to negative yardage (UMass minus-23, UConn minus-6). The only two running backs to put up 100 yards against BC were Clemson’s Wayne Gallman (109) and Florida State’s Dalvin Cook (108). Landry has been a consistent playmaker. His 12 sacks are tied for third in the country, he is 15th in the nation with 16 tackles for losses (of 117 yards), and his seven forced fumbles lead all of college football. “On defense, like on offense, you need to be explosive,” said BC coach Steve Addazio, whose team visits Wake Forest Saturday in the regular-season finale. “Harold creates explosive plays. He’s an explosive guy off the edge. Landry has built on a sophomore season in which he had 60 tackles and 4.5 sacks and earned All-ACC honorable mention. He is one of 24 players on the watch list for the Ted Hendricks Award, given to the nation’s top defensive end. “His fundamental growth has been phenomenal,” Addazio said. “That’s the kind of play you need. You need a defensive end that can get home. I mean, those are explosive plays on the defensive side of the ball, kind of like perimeter people are sometimes or a tailback is home-run-hitting on the offensive side of the ball. They kind of go hand in hand. Landry needs one sack to match the school season record shared by Mike Mamula (1994) and Erik Storz (1997). With 16.5 for his career, he’s already eighth on BC’s all-time sack list. Mathias Kiwanuka’s record of 37.5 may not be out of reach. The question is whether he will return for his senior season or test the waters of the NFL Draft. He is generally considered a top-five prospect among defensive ends. Even though he has carried himself like a professional all season, he’s holding off on thoughts about the next level.